Fall is a popular season for weddings, but always leaves guests guessing what to wear. Fall wedding guest dresses are actually really pretty and such a fun season to dress for. So what is my favourite kind of dress to wear to a fall wedding? 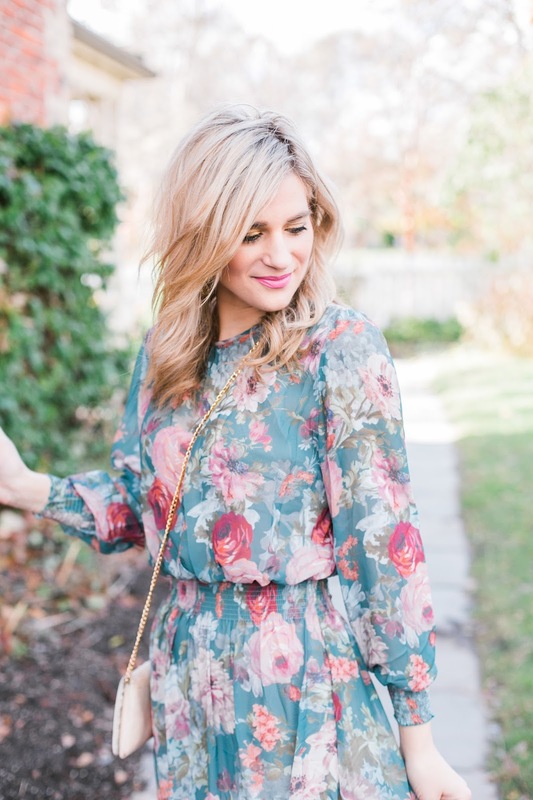 This floral midi dress is the perfect dress to wear as a guest to a fall wedding. 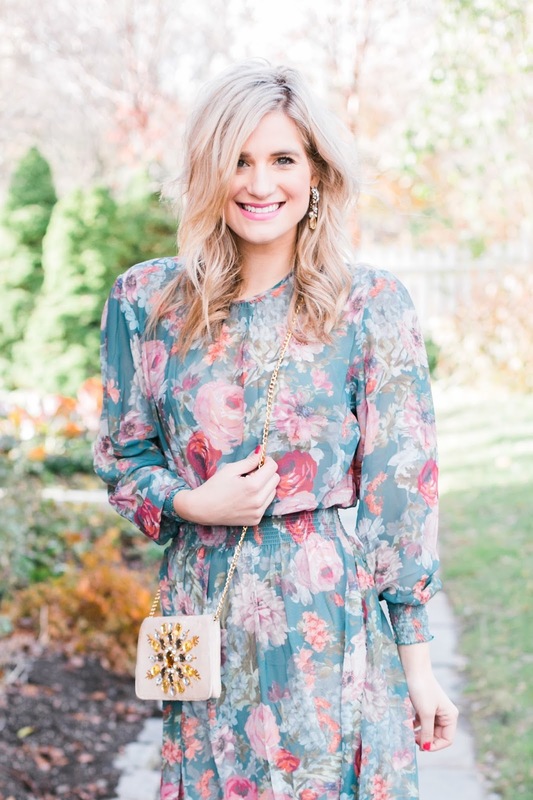 Check out my general tips for choosing a floral dress to purchase for a Fall wedding. Cooler temperatures call for thicker materials, dresses with sleeves, and darker tones so chances are for a fall wedding you would pick a dress with a material that is a bit thicker like velvet. But you can still wear a lightweight dress in the fall as well and pair it with a shawl or a cozy yet elegant knit cardi to keep warm. Don’t limit yourself to thicker material dresses. 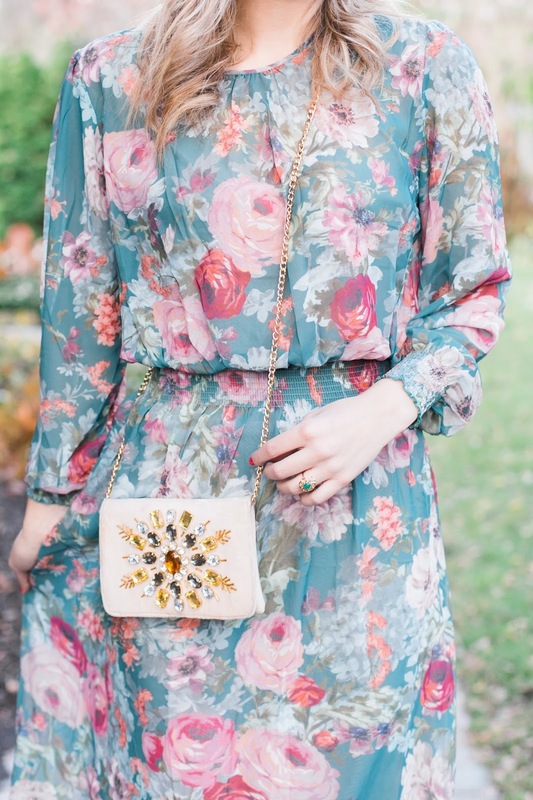 I love the playful print of this floral dress. The contrast of the earthy tones with the flirty pink florals makes the dress the perfect option to wear to a fall wedding as a guest. If you want to wear a solid colour dress opt for rich deep colours like maroons, deep purples, and emerald greens. Emerald green tones are my favourite colour for fall and my dress definitely has tons of green on it. This floral dress with its long sleeves, and midi length screams femininity. The long sleeves also make it weather appropriate. This delicate floral dress is the perfect dress to choose not only for a fall wedding, but for weddings all year around. Best part it is only $26! I am wearing a size medium so it does run a bit small. Dress: Make sure you grab one before it sells out! Don’t be overwhelmed of what to wear to a fall wedding as a guest. You have tons of options when it comes to Fall wedding attire. Would you wear this dress to a fall wedding?